Well, it has been 2 years since my last “things I’m loving” post, and I have some new fun ones to share! These posts are a break from my usual recipe posts and I meant to make them a regular series, but they’ve become more of a rare and occasional treat. I guess it takes me a while to get passionate enough about a handful of products/services that I want to shout it from the rooftops (or, in this case, share it on my blog)! 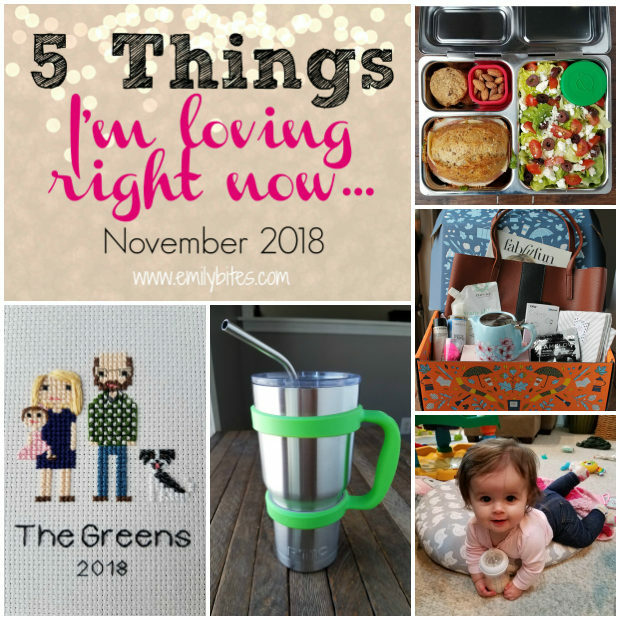 I’m actually still obsessed with every one of the 5 things I shared last time, so here’s a link to my Things I’m Loving: December 2016 post if you want to check those out as well. They’ve totally stood the test of time! I also love hearing about the products, foods, services, gadgets, websites, etc that you can’t get enough of right now, so please, share them in the comments! Maybe we’ll each learn about something fun we never would have known about. Plus, with the holidays around the corner, we might all get some ideas for our wish lists or gift ideas for our friends and families! Some of the links in this post are affiliate links. This means that if you follow my link to Amazon I may get a small percentage kickback from your purchase, or if you use my FabFitFun link to sign up and receive $10 off, I will also get a credit from it. None of this happens at any cost to you, it’s just a bonus that certain websites offer for sharing their products. I did not choose my 5 things based on whether or not there is an affiliate program (some have one, some don’t), but in the cases where there is one, I figured I might as well use the affiliate link! In addition to my own five things I added a bonus to the end of this post – one of your (my readers’) favorite things! It’s one of the things I’m always asked about, so make sure you get to the end to find out what it is! I needed a hobby. My husband has a whole bunch of them. He loves woodworking, hiking, working on the house and yard, playing video games, fishing, and a whole bunch of other fun and interesting things. For the past 8 years, my hobby has been this blog, cooking and playing with recipes, but now that this is also my job (something I am in no way complaining about…it’s a literal dream come true and you are all to thank for it), I wanted something else to do in the evenings after Claire is in bed besides (or in addition to) watching trashy reality shows. Preferably something crafty and creative that I could pick up and put down when I had time and would make me feel accomplished. I had mentioned a few different things like pottery, etc before I came across a social media post for Stitch People. I was instantly obsessed. I guess I should explain. 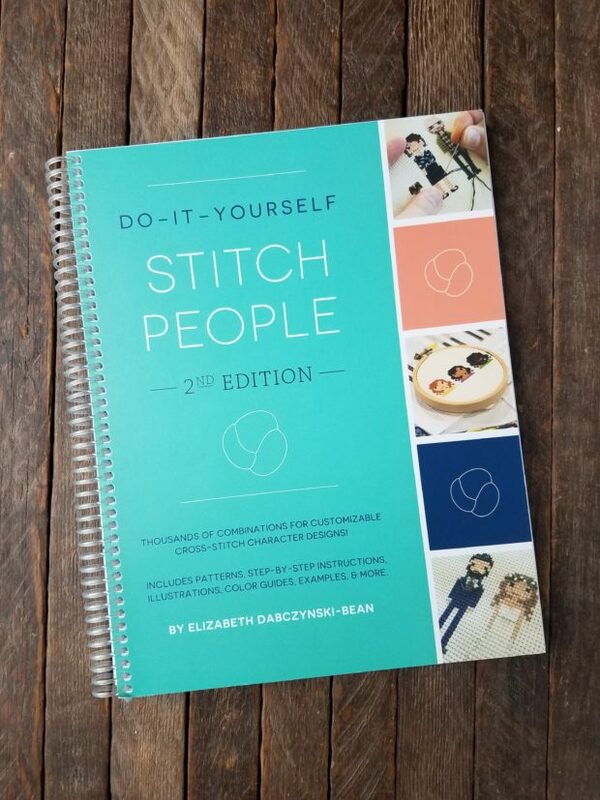 Do-It-Yourself Stitch People (2nd Edition – it just came out in October) is a book by Lizzy Dabczynski-Bean that teaches you how to cross-stitch portraits of your own design. You can customize different characters and pets to look like everyone you know. I had never cross-stitched before but I started scrolling through #stitchpeople hashtags on Instagram and after I had bookmarked 20-30 of them I thought “I need this book.” Even if you’ve never picked up a needle before, this book will make you feel like a #FlossBoss in no time (a little cross-stitching humor for you). It takes you through the materials you’ll need, the basic stitches, how to design a piece, tons of patterns for different clothing, hairstyles, pets and accessories, how to frame it when you’re done – everything. 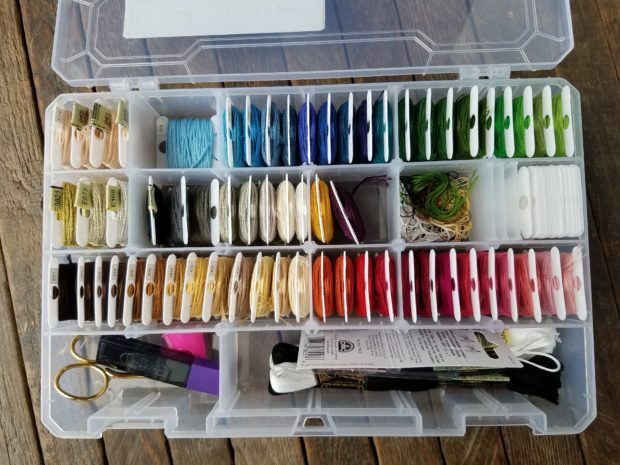 Plus, when you buy it you get invited to join a private Facebook community full of other stitchers ready to offer help and feedback and inspiration. My Family as Stitch People! Stitch People is the perfect hobby for me. I get so much satisfaction out of planning the design out on graph paper and seeing my friends and family come to life when I start stitching. I’ve completed two portraits so far (I’m working on a third right now, but it’s a gift so no spoilers! ), and I’m so proud of both of them! 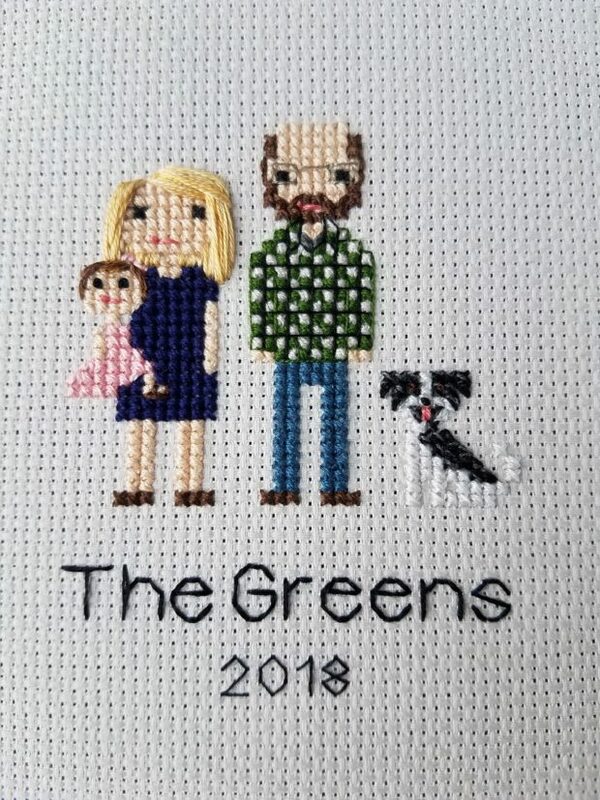 I did one of our family (me, Mr. Bites, our baby Claire and our dog Bennett) and actually, the one pictured is my second go of it because I learned some things making it the first time. 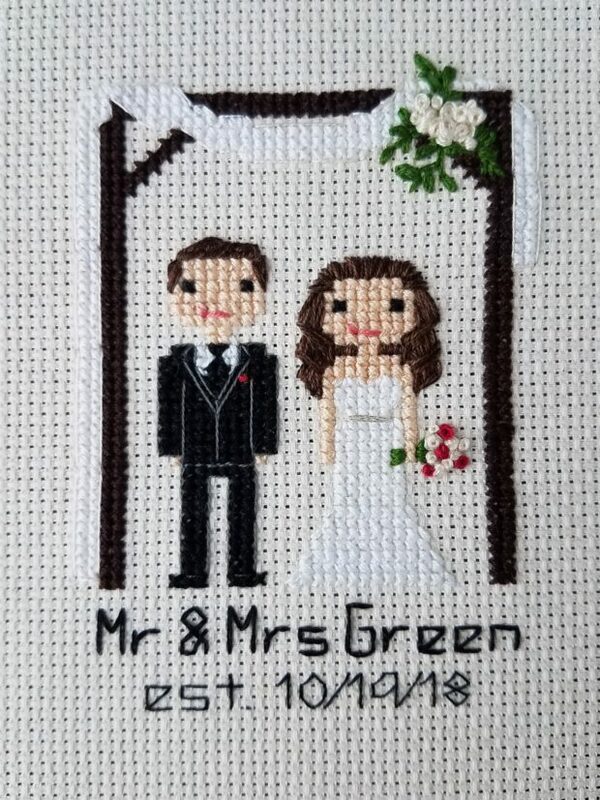 I also made one for my brother-in-law and new sister-in-law for their wedding. I was lucky enough that the bride shared many of the details with me beforehand so I was able to get the dress, tux, flowers, hair and arbor just right. 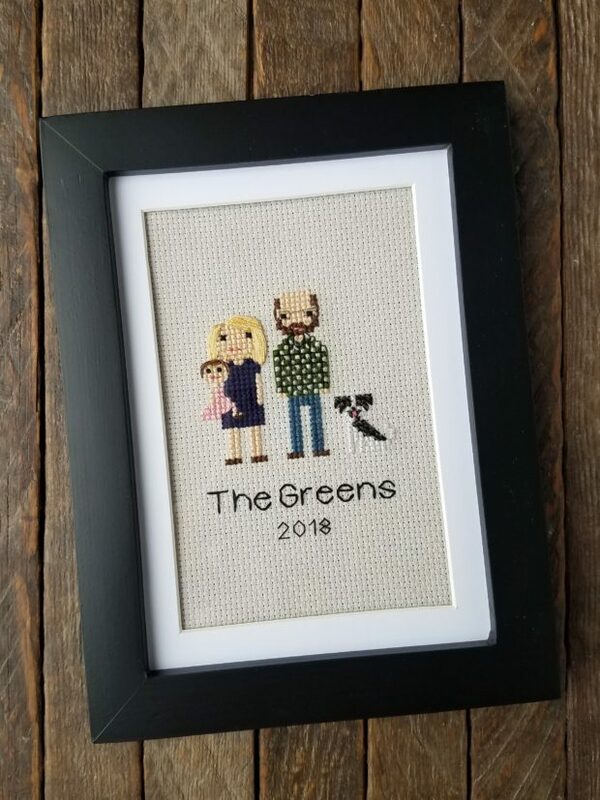 Stitch people portraits make great unique gifts and are a fun way to celebrate milestones like a wedding or new baby. I feel like they take a craft that’s considered “old” and freshen it up into something more current. Plus, once you get the hang of it, you can branch out and add a lot more detail to your portraits. I can’t wait to make more and get better! If you stitch, I’d love to see your stitch people! I’ve already gotten so many ideas and so much inspiration from looking at other people’s portraits and I hope to see yours soon. Stitch People portraits can be easily framed for display and for gifts. This tumbler may not seem like something to be over the moon about, but my husband got me this cup two years ago for Christmas and I swear I’ve barely put it down since. It’s seriously one of the best gifts I’ve ever received. I bring it everywhere I go – in the car, to friends’ and family’s houses, on vacation. When I’m home it’s always by my side and when I sleep it’s on my bedside table. The only time we’re apart is when I have to wash it. I’ve had friends refer to it as my adult sippy cup, and that’s…not inaccurate. Why am I so obsessed with a steel cup? I drink a lot of water and I strongly prefer it be ice cold. This cup keeps my water cold for-e-VER. I go to bed with ice water on my nightstand and wake up in the morning with ice water right next to me. I go sit by the pool in the summer and my drink stays cold in the sun and heat. I run errands all afternoon and whenever I get back in the car I have ice water waiting for me. 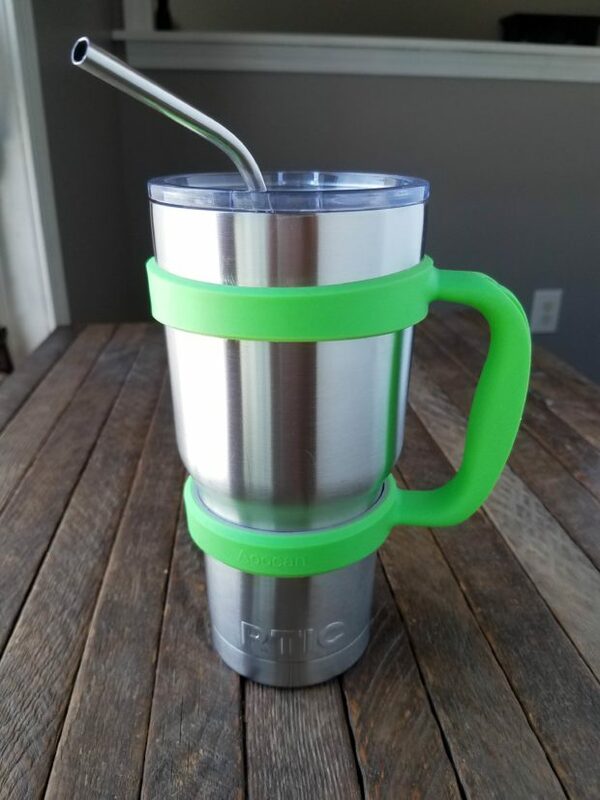 Not only that, but the cup doesn’t “sweat”/condensate, so I don’t need a coaster and the insulation keeps the outside of the cup from getting cold/hot to the touch from your beverage. I don’t drink a lot of hot beverages, but supposedly it works to keep those hot as well! Plus, the 30 oz tumbler is a nice size that isn’t too clunky but holds enough that you’re not constantly getting up for more. 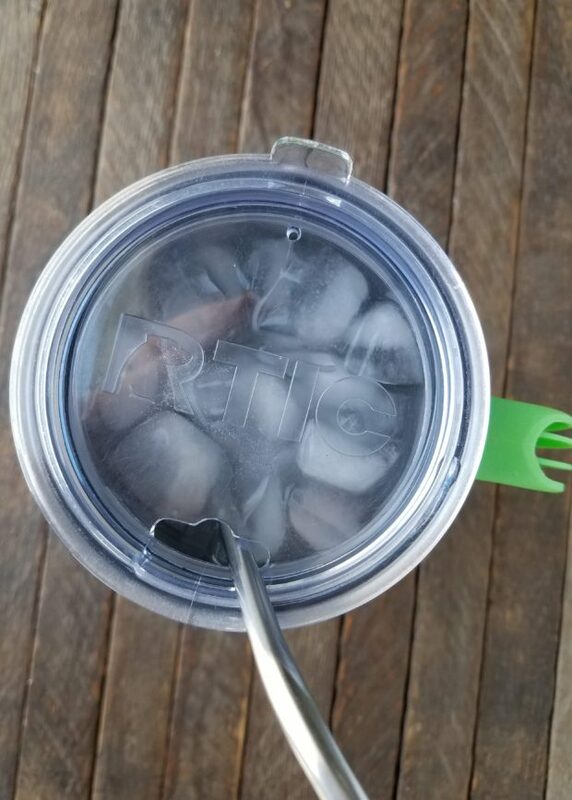 A ton of different brands sell similar tumblers (such as the pricier and better-known Yeti), and they probably all work well, this is just the one I happen to have. I like that it comes with a see-through airtight lid so I can easily check how much I have left. Evidently mine is an older version and the new version with a sealable lid can be found here in a bunch of fancy colors! I also have two accessories for my tumbler that I highly recommend. I have these stainless steel straws that I absolutely love, and this slide on handle which I also find convenient. For those of you who are trying to drink more water and like it to be cold, I sincerely believe this cup makes me drink twice as much water than I did before I had it. I can also say from experience that it makes a great gift! My first FabFitFun box was just last season (Fall 2018) and I’m already obsessed. 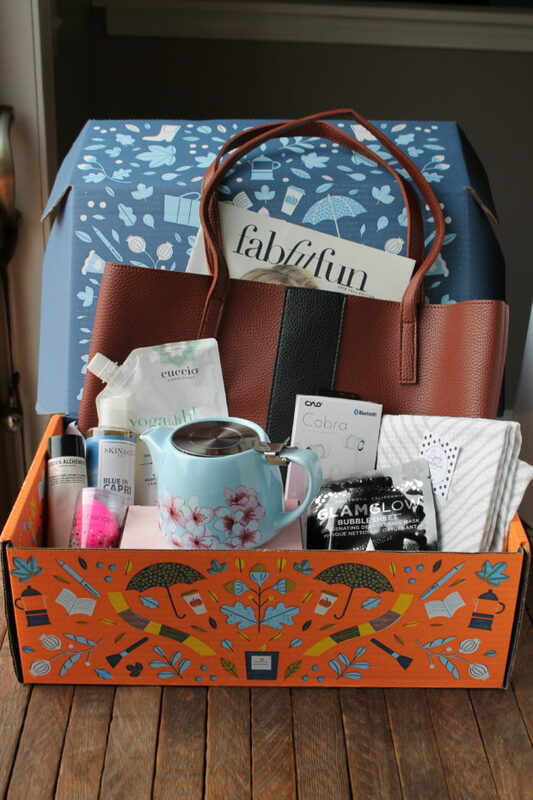 If you’re unfamiliar, FabFitFun is a seasonal subscription box that comes out four times a year and is filled with full-size products and goodies for women that span a bunch of categories: fashion, beauty, wellness, home décor, tech, etc. Some of the items are given to everyone, some are chosen for you based on a quiz you take when you sign up, and some you get to choose yourself from a few different options. The retail value of my box was $357, but the subscription is just $49.99 per season! I’m not partnered with FabFitFun in any way, but because I’m a member I can offer you a discount code for $10 off your first box if you sign up using my link, so your first box would only be $39.99! 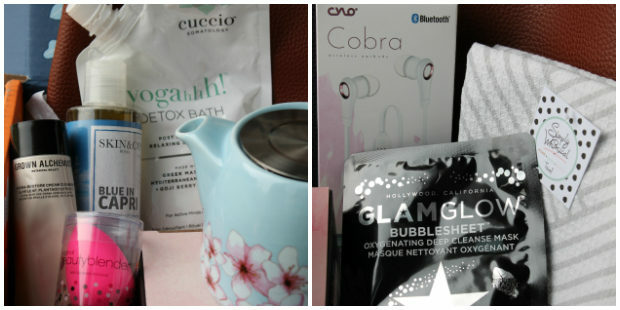 I have used or am going to use almost every single thing in my Fall box (the only thing I might not use is the teapot), but even if I was only going to use 1-2 things and re-gift the rest this box would be worth it. I was already able to pick a few of the customizable options for my winter box and I’m excited to be getting over-the-knee socks that will look so cute with boots, Oribe Gold Lust dry shampoo, a warm headband and glove set that will be great for winter here in Buffalo, and a cozy, neutral colorblocked Mark and Graham throw blanket. I can’t wait to see what else is in there! In addition to the boxes, FabFitFun also gives members a chance to “add on” items to their box at deep discounts. For example, I wanted to try a higher end moisturizer and the Murad Hydro-Dynamic Ultimate Moisturizer which usually retails for $75 was a $19 add-on, so it’s coming in my winter box! Bonus! If you want to give the winter box a try, you can use my link to get $10 off your first box. It’s an awesome deal! Here are two monthly views in the tinybeans app. If you click on any day in the app, you can scroll through all the photos, videos and comments from that day. If you have a baby, child, several children, a baby on-the-way, a niece or nephew, a grandchild, or maybe even a pet you treat like your baby, you need to know about tinybeans! 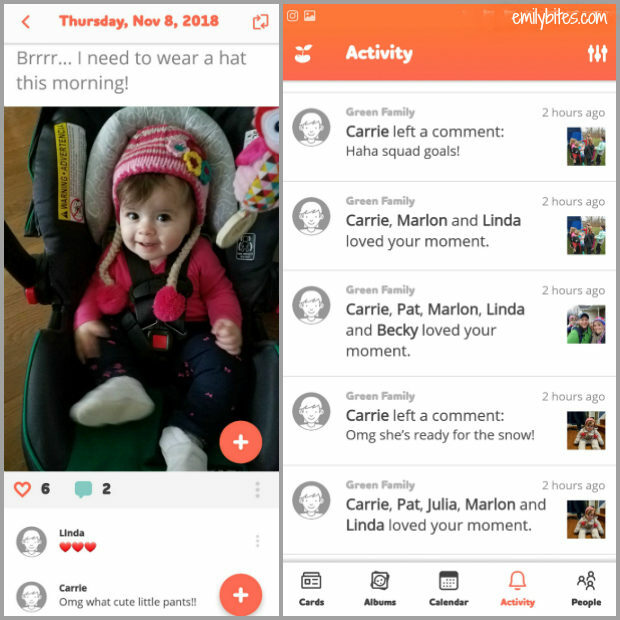 Tinybeans is a website/app where you can upload all the photos you take of your child and share them with only the people you choose. Rather than flooding your facebook or IG feed with 10 pics a day of your baby that your ex-coworker or the guy that sat behind you in math class couldn’t care less about, you can upload them to tinybeans where only those who do care can gush over them. The thing is, while Tom from math class may not want to see those pics, I know the baby’s grandparents, great-grandparents, aunts, uncles etc want to see as many pics as they can. Tinybeans is so much better than texting pics all day. 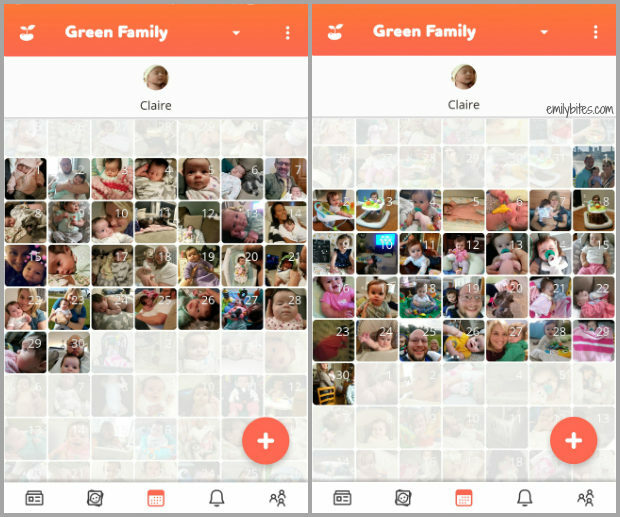 Here’s how it works: As the parents, you can invite whomever you choose to view your family’s tinybeans album. You also get to choose what access they receive (like whether they can add pics as well) and once they accept they can choose what notifications they’d like to receive and how often (such as a weekly email of photos, or push notifications for comments). If you follow more than one family on tinybeans you can easily toggle between albums and customize different settings for different albums (I may want push notifications when someone comments on my baby’s photos, but not when someone comments on a photo of my nephew). Once you’ve chosen your settings, you can upload photos with captions and share away! The friends and family you’ve invited can check out the pics at their leisure as often or infrequently as they like, and get notifications and reminders to check only as frequently as they want. For instance, if late afternoon hits on any given day without any photos uploaded, I can expect both of Claire’s grandmas to text me something like “where’s my tinybeans? !” My friends are more likely to get a weekly email reminder and go in and look through the photos from the week. Two screenshots from tinybeans: one to show what a photo, caption and comments look like in the app, and one to show the activity log where you can view likes, comments and new uploads from the journals you follow. We’ve received tons of great feedback from friends and family who are thrilled we use tinybeans. My mother-in-law lives across the state from us and told us she’s really thankful that she gets to see daily pics of Claire growing up, trying new things and being adorable. It’s a great way for extended family to share in Claire’s funny moments, milestones and more. You can also post videos, which are always a big hit. The app and website are both super user-friendly, Claire’s great-grandparents (my husband’s grandparents) use it to check up on her daily! In addition to being a great way to share photos and videos with others, my husband and I have found we love how easy it is to go back and look through pictures and moments to reminisce and see how much she’s changed over the last 8 months! When we look at pics from just a couple months ago it’s amazing how different she already is in a short time. Additionally, when I’m trying to remember when she started sitting/getting teeth/rolling over/etc, I can easily go back and look at tinybeans for photo confirmation! Tinybeans is free to use, you own all your photos and it’s a great private way to share pics of your little ones with trusted friends and family. If you have a little one, their grandparents will thank you! 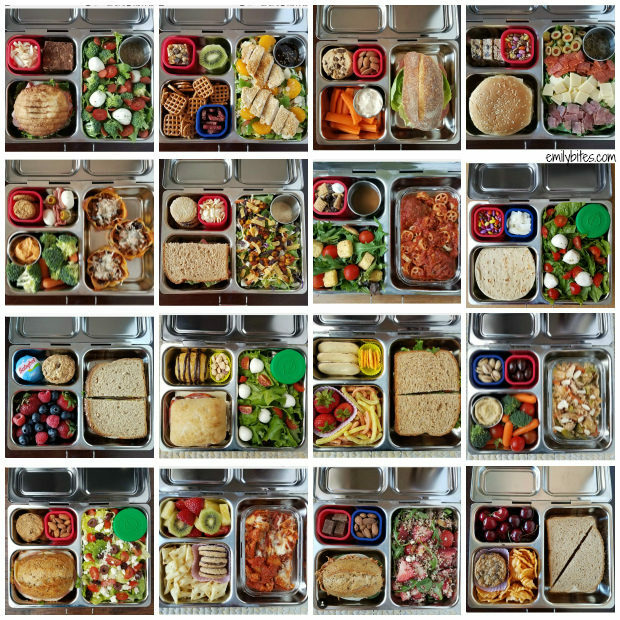 Some lunches I’ve packed in our Planetbox! Check out @lunchboxbites on Instagram for more ideas. About a year and a half ago, I decided I wanted to start packing lunch for my husband to take to work a couple times a week. I work from home, so it’s easy for me to eat whatever I want for lunch, but he was often working right through lunch or having to grab something out. Plus, he does so much to make my life easier and I thought this would be a nice way to give him a little something back. 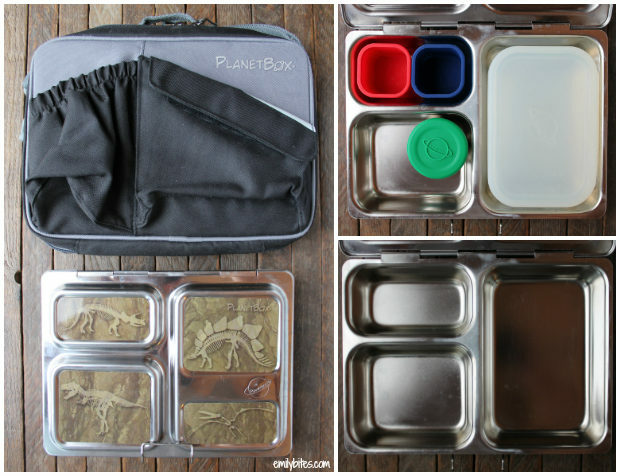 I first saw Planetbox lunchboxes on Instagram from the lovely @leslielosingit, who was packing lunch for her husband and four kids, and I was intrigued right away. The bento-box style compartments make it super easy to be creative and are helpful for portion control. The stainless steel box is high quality and seems like it is built to last for a really long time. It eliminates the need for a million little plastic baggies, so it’s good for the environment. Plus, it’s easy to clean and can go in the dishwasher! There are three different sizes of Planetboxes: the Shuttle, the Rover and the Launch. The Shuttle is more of a snack box and is smaller with just two compartments. The Rover and Launch are both meal-sized, but the Rover has 5 compartments which allows for more variety and the Launch has three larger compartments which allows for bigger serving sizes. For an adult man, I figured the Launch was the right fit. I was a little concerned about whether the portion sizes would be enough to fill him up, but once I started packing him lunch in his Launch box he said it was perfect! Just the right amount to feel satisfied without feeling over-stuffed like he sometimes did when he ordered lunch in. Mr. Bites was happy and felt like he was eating healthier and I was enthusiastic about coming up with creative ways to fill up the compartments! I started a second Instagram account where I sometimes share pictures of the lunches I make my husband called @lunchboxbites. I love searching the #planetbox hashtag to get creative ideas on other things to pack and I’m excited for when our daughter goes to school someday and I can get her the Rover and pack her lunch as well. You get to choose different fun magnets as a design for the top of your box (Mr. Bites has dinosaurs) and you can get lunch bags in fun colors to carry the box in as well. I do recommend getting some of the accessories for the boxes. For the Launch, we bought the carrying bag, the satellite dish (a glass container with a silicone lid that fits in the largest space in the box and is great for packing leftovers that need to be reheated in the microwave or wet foods like yogurt or stew), and the pods (small silicone cubes that are the perfect height to further section off the compartments of the box and fill with nuts or treats). The box already came with a small metal sauce container with a silicone lid that is great for salad dressing or a dipping sauce like ranch or hummus. I use all of those accessories on a regular basis. I know the box plus accessories ends up being pretty pricey for a lunchbox, but it’s so sturdy that I feel confident it will last us for many, many years and I find it to be much more fun and inspiring to pack then a regular lunch bag. I pack lunch in it way more often than I would without it and I feel good about not wasting so many plastic baggies. Whether you’re packing your own lunch for work, packing for your kids, or packing for your spouse, definitely give PlanetBox a look! I suggest checking out their Instagram feed or hashtag for ideas and inspiration. It can be a great way to bring fun and healthy meals to work or school. Bonus: Stoneware Soup and Side Bowls! 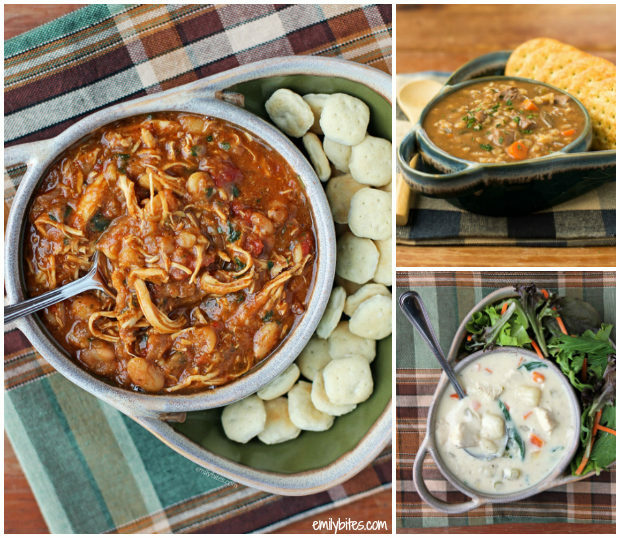 My White Chicken Chili, Slow Cooker Beef Barley Soup and Creamy Chicken and Gnocchi Soup, all pictured in these bowls. I’m including this because from what I can tell, this is one of YOUR (my readers’) favorite things! Every single time I post a recipe that uses these bowls in the photos I get tons of comments asking where to get the bowls. I’m always like “hey, did anyone notice the yummy soup recipe…? No? Just the bowls?” Haha. To be fair, these are great bowls. Perfect for soup with a side of crackers/a cut up sandwich/a salad, chili with a side of fritos, dip with a side of veggies or chips, or even yogurt or oatmeal with a side of fruit or other toppings – you’ll get a lot of use out of them! I got them as a gift (Thanks Gram! ), but they are sold as a set of two on Amazon. For everyone who has inquired about these, go add them to your cart right now! So, that’s what I’m loving right now – let me know what you think! If you’re loving my favorite things and want me to do more posts like this or if you want to tell me some favorites of your own (I would love that), leave a comment below. I want to hear from you! I’m also considering making one of these posts specifically for baby items I love if there’s interest. Let me know if that’s something you want to see! You are seriously THE CUTEST couple. I love the Stitch People book! I stitched my mom and her husband last year and made it into a Christmas ornament. Love those Planetbox lunchboxes! Thank you so much! I am wishing the same for you and yours :). Thanks! Ordered those soup bowls for daughter and sis for Christmas! Yay, I hope they love them! I love your favorite things! As a childless human with 6 shih tzus, I wonder if tinybeans would be perfect for all of my pup pics? Hummm…. Haha, I definitely also sometimes post pics of my havanese-shih tzu mix on there, he’s my original tiny bean! I think it’s great for human babies and fur babies alike, lol. We love Tiny Bean too! It’s nice to have a little privacy for the kiddo photos. It’s so much fun, you’ll love it!! The stitch people are too cute! Yours look awesome. I love the tiny beans idea too though, as I always feel a little weird putting kid pics somewhere with such a wide audience, and the grandparents would love it. Your little one….ADORABLE! I love your recipes 🙂 I use many in my meal planning for the week…middle school English teacher! Enjoy your little one…time goes by so quickly. I lost my dad 3 weeks ago to cancer….so your post made me smile! As a mom to a 4 month old baby girl, I just love Tinybeans too! I love how I can share her growing up with all my family and friends back home in Wisconsin while we’re living in Texas! Because like you said, not everyone cares to see a gazillion pictures of your baby on IG or FB and it’s not convenient to mass text the pictures either! Have you looked into making a photo book yet? I looked briefly but haven’t really had time to sit down and really work on one (mom life plus working = BUSY)!